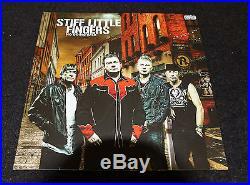 Stiff Little Fingers Vinyl Record – No Going Back. Signed, Then Sealed and Then Delivered. This record was pre-ordered through The Stiff Little Fingers Pledge Music site, and was paid for in January 2013, which was over a year in advance. This was done so the record could be made without any involvement from record companies, and it was financed through pre-sales from fans, with some exclusive items made available to those fans prepared to take the risk, and put up cash to ensure this record was made. 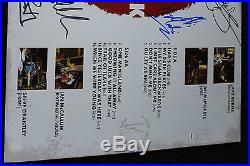 This issue is as early pressing that you can get, and comes with a rare insert that thanks the owner for the contribution in making the record (insert is pictured) – you will not get this insert or autographs unless you invested in the production of the album. This is a genuine First Pressing. There were only 100 of these signed and sealed copies, (with the insert) ever available to fans, and only available through financial pledges, and they were the first 100 off the press.. This record was financed by fans, and these fully signed records were signed before they were sealed… I had to open one, as the signatures were not visible with the gatefold opening sealed, and I just had to see them. This issue was part of the pre release on March 15th 2014, and was not available to the public until the official release on August 11th 2014. If given as a gift – This record will knock their socks off – when they break the seal… To find that it is one of the first 100, fully signed, and has an insert that is unavailable under any other circumstances… The initial surprise of receiving a new SLF record, will be totally blitzed by the amazement, when they see what is inside the shrink wrap seal. Keep a camera handy for that moment. On 9 March 2007, Burns announced that Stiff Little Fingers would be recording a new album which would hopefully be completed by the end of 2007. They have previewed a track from the new album, “Liars Club”, at live concerts. The track is named after a bar Burns drove past on his way home whilst listening to a press report about Tony Blair, George W. Bush and the Iraq War. At the Glasgow Barrowlands gig on 17 March 2011 Burns announced that a new album was being recorded hopefully for a 2011 release before launching into a new song, “Full Steam Backwards”, about the banking crisis in the UK. On 16th October 2013, the band launched a project on Pledge Music to raise funds for a new album to be released in March 2014. The project reached its funding goal within 5 hours. 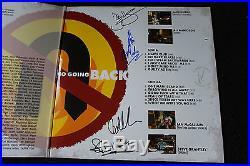 The title has been confirmed by the band as No Going Back with recording completed in January 2014 and will be released first on March 15, 2014 through Pledge Music and to the general public on August 11, 2014. A tour in support of the album kicked off in the spring of 2014 and includes dates in the U. On the Summer Nationals tour which features The Offspring, Bad Religion, The Vandals, Pennywise and Naked Raygun. On 14th September 2014, the album reached No. 1 on the Official BBC Rock Album chart. It was also placed No. 4 on the Indie Chart and No. 28 on the full album chart. SLF Early History 1977 – 2014 Prior to becoming Stiff Little Fingers, Jake Burns, vocals and guitar, Henry Cluney, guitar, Gordon Blair, bass, and Brian Faloon, drums, were playing in a rock music cover band, Highway Star, in Belfast. Upon the departure of Gordon Blair (who went on to play with another Belfast group, Rudi), Ali McMordie took over on bass. Cluney had by this time discovered punk, and introduced the rest of the band to it. They decided that Highway Star wasn’t a punk enough name, and after a brief flirtation with the name “The Fast”, decided to call themselves Stiff Little Fingers, after the Vibrators song of the same name. It was while doing a gig at the Glenmachan Hotel that they first met Gordon Ogilvie, who had been invited along for the evening by Colin McClelland, a journalist who Burns had been corresponding with. Ogilvie suggested they play material based upon their experience of the Troubles. McClelland arranged to get the band some recording time at a local radio station, and in the studio normally used to record jingles, they recorded “Suspect Device”. The single was packaged in the form of a cassette, with a cover depicting a cassette bomb, apparently causing great hilarity in the group, when one record company phoned them and asked for another copy, as they’d thrown the first one in a bucket of water for fear that it was a real bomb. A copy of the single was sent to John Peel. He played it repeatedly leading to a distribution deal through Rough Trade. 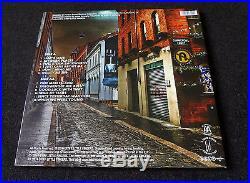 Peel later did the same with the first single by another famous Northern Irish band from Derry, The Undertones. There were a number of well-publicised arguments between the two bands; the Undertones accused Stiff Little Fingers of sensationalising the Northern Ireland conflict, while they retorted that The Undertones ignored it. Their second single, “Alternative Ulster”, was originally intended to be given away free with the fanzine of the same name. In the second half of 1978, they toured with the Tom Robinson Band, and in 1979, they released their first album on the Rough Trade Label, Inflammable Material. The band agreed a contract with Island Records, but it fell through, leaving the band to release the album on their existing label. Inflammable Material was the first album distributed by Rough Trade records, and the first independent album to chart in the UK. This inspired their move to London, which led to the departure of Brian Faloon and Colin McClelland (who along with Gordon Ogilvie had been joint manager of the band up until that point). Jim Reilly became their drummer in time for the “Gotta Gettaway” single, and played in the Rock Against Racism tour. Sometime after, Stiff Little Fingers were banned from playing Newcastle upon Tyne, after a local councillor heard “Inflammable Material” being played by his daughter. The track was “White Noise”. The songs lyrics include racially offensive terms, but it is an anti-racist song, with the last verse about Irish people hitting home with the message. Nobody’s Heroes and Go for It. In mid-1979, Stiff Little Fingers signed their Rigid Digits label to Chrysalis Records, and in 1980 released their second album, Nobody’s Heroes. The Nobody’s Heroes era brought some success in media terms, with the single “Straw Dogs” narrowly missing the cut for Top of the Pops; they eventually got on the show twice, with “At the Edge” and Nobody’s Hero. ” However after their appearance with “At The Edge the band were told they would never be invited on again as they did not take it seriously as they weren’t playing live. It was to be one of the most infamous TOTP’s appearances. They subsequently appeared on Top of the Pops for “Nobody’s Hero”. In 1981 the band released their third studio album Go For It which was to be Jim Reilly’s last involvement with the band. Go For It signified the change in Burns’ writing style, with much darker and taboo subjects, such as domestic abuse in the song “Hits and Misses” and football hooliganism in the song “Back to Front” (not on the original LP but a bonus track on CD reissue) but the band also still told the story of being a teenager growing up with the song “Kicking Up a Racket”. (actually their fifth album, as they had released a live LP, Hanx, as their official third album between Nobody’s Heroes and Go for It). Now Then was the first album for former Tom Robinson band’s drummer Dolphin Taylor. In the face of low sales and concert attendances, they broke up in 1983, when Burns said: Our last LP Now Then was to my mind the best album we have made. But it is also unfortunately the best I think we will ever make. So I have decided to call it a day. The band later revealed the original split had been somewhat acrimonious, with band members apparently having fistfights rather than talking through their differences. After Burns had moved on from SLF, he had a short stint at a band with former The Jam bassist Bruce Foxton. They made a couple of demos, but Foxton then received an invitation to make a solo album which ended their collaboration. Some years later in 1987 the call came from Ali Mcmordie for the two to go out for a drink, a few beers later and talk changed to that of bands which had successfully got back together and ultimately they decided to reform. When the two announced their plans and got Henry Cluney and Dolphin Taylor back on board they looked forwards to hitting the road again. The band changed their plan of it just being a temporary re-union and decided it was going to be permanent. Ali McMordie decided he could not commit the time to tour full-time or record and so left, being replaced by Bruce Foxton in time to record 1991’s Flags and Emblems. In Britain, the single from this album, “Beirut Moon”, was withdrawn from sale on the first day of release,  allegedly because it criticised the government for not acting to free hostage John McCarthy, who had been held in the Lebanon. In 1993 Burns had his manager tell Henry Cluney that his services were no longer needed and to leave the band,  and the trio of Jake Burns, Bruce Foxton and Dolphin Taylor continued for the next four years, joined on live shows by either Dave Sharp or Ian McCallum. In 1994 they released Get a Life in the UK, releasing it in the U. By the end of 1996 Taylor left due to family commitments. Burns called in Steve Grantley who had played drums for Jake Burns and the Big Wheel in the late 1980s. Tinderbox – Guitar and Drum. The trio of Burns, Foxton and Grantley recorded 1997’s Tinderbox album, with help from Ian McCallum who joined as a full-time member for 1999’s Hope Street. This same line-up recorded 2003’s Guitar and Drum. On 18 January 2006, the following announcement appeared on the SLF Website. Bruce Foxton has announced that he is to leave Stiff Little Fingers with immediate effect. After 15 years of writing, recording and touring with SLF Bruce says it is time to move on and concentrate on other projects. “The situation is amicable” says Foxton. I have enjoyed my time with Jake, Ian and Steve and will miss them. Naturally I wish them all continued success and hope to catch up with the boys during their spring tour. ” The band released a statement saying “Obviously, we as well wish Bruce every success in everything he goes on to do in the future. He has been a fantastic asset to the band and we’ll miss him as well. Left to right: guitarist Ian McCallum, drummer Steve Grantley, frontman Jake Burns, and bassist Ali McMordie. On 23 January 2006, it was announced that original bass guitarist Ali McMordie was to rejoin the band for the duration of their upcoming March tour. The tour was a success, with many fans writing into SLF’s message board saying how much they enjoyed it, and how fired up the band seemed to be. After much discussion regarding the status of McMordie within the band after the tour, on 21 April 2006, Burns posted on the message board For the time being Mr. McMordie is happy to continue as long as his busy schedule allows. It may be that occasionally we have to bring on a “substitute”, if he is up to his eyes and we need to do something, but hopefully we can avoid that. On 25 May, 2006, SLF announced McMordie would not be able to join the band on its Spring US tour due to health reasons. John Haggerty of Pegboy and Naked Raygun fame would fill in on guitar. McMordie has since rejoined the band and has toured with them ever since. 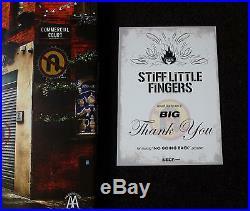 The item “Stiff Little Fingers No Going Back 2014 Signed Sealed & Mint LP Vinyl Record” is in sale since Thursday, February 11, 2016. This item is in the category “Music\Records”. 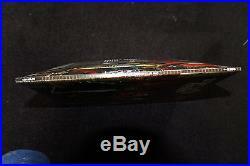 The seller is “australian-vinyl-vault” and is located in Kelmscott, WA. This item can be shipped worldwide.